One of the perks of working for an organization (as opposed to freelancing) is the ability to have said organization foot the bill (within reason, of course). Suffice to say that Sophie is very excited to hear that Mercy is in town. The reasons for this will become clear later. As usual, one way to support what we're doing here is to vote for Autumn Bay at Top Web Comics. You'll get an EXCLUSIVE sneak peek at the future! Here's a little Autumn Bay holiday treat! 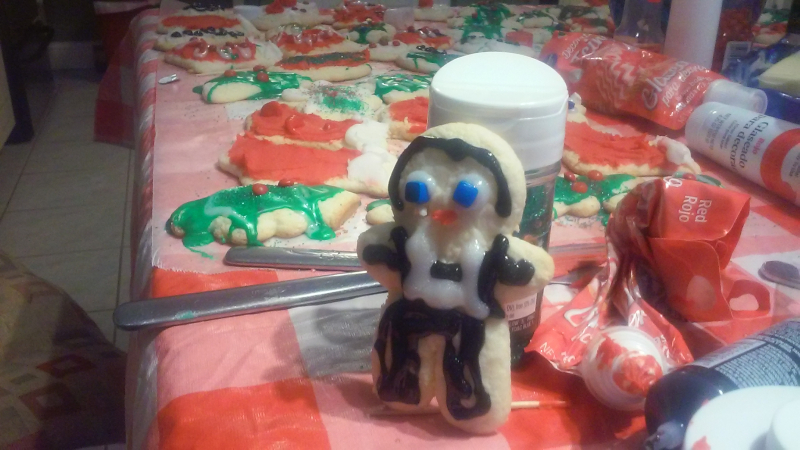 It's Mercy in cookie form! Ha Ha Ha! Love Mercy's reaction! My guess at the unmitigated joy? "Corporate Expense Account"--Mama takes care of her kids! Well, there is more to it than that... They have history (which will be elaborated upon later). But yes, Mercy DOES take care of her kids! Hahaha that was about my reaction when Mercy showed up too, Sophie! Okay I love this page .. the way mercy held the phone away just made me crack up laughing and thats a hard thing today! Awesome stuff Prof! Don't see many phones like that anymore! Weponizing the squee would be a cool idea. You could make a squee gun..though I do believe the Geneva Convention only prohibits weaponizing the "mom look". NO ONE should have that much power. Speaking of nostalgia, there's a twinge of noir about Mercy, isn't there? She's got the cigarette and the narration going on. She just needs a brownstone brick office and a '47 Chrysler. There always HAS been a bit of the noir about her. She has the cigarette and the narration, as well as the penchant for not top-of-the-line scotch. Oh my god, I love the cookie! EEEEEEEEEEEEE! lol goddammit i love this xD you get so much characterization with her done so quickly. well done! Thank you kindly! She's fun to write. That last panel is perfect. Liking the static effect for the phone voice too. Thanks! It did work pretty well, and is likely to become a regular effect.